Greetings from John Goodman, the new Skamania PUD General Manager. I’ve been here for about ten months now and very much enjoy working with all the Skamania PUD family. After last year’s storms this winter has thus far been much easier for the PUD to endure. We’ve had a few small outages caused by limbs and trees coming down during windstorms, but fortunately no ice issues. Our tree crew continues to trim back trees and brush around the PUD’s power lines throughout the county to help minimize future outages. The PUD has had a busy year working on upgrade projects throughout the county. For the Electric System, the design is complete for a rebuild of the Carson Substation and a 2-mile section of distribution power lines feeding the Stabler area. This will allow us to improve the quality of our service, increase the amount of power available in Stabler, and reduce some of the energy losses we encounter in the distribution of power. Construction for both projects will occur this summer. At the same time your PUD crews will be replacing over 5 ½ miles of buried underground cables throughout the county. We have been experiencing many outages caused by these old, end of life buried cables from the 1970s, so the cable replacement program will greatly improve power reliability. For the Carson Water System we are just finishing construction of the new Brooks Reservoir. This 400,000-gallon reservoir improves water reliability, provides added water storage and additional fire protection for the community south of the High Bridge. We are also updating some of our controls and monitoring systems. The old system used paper graphs to record the output of monitoring equipment, which required that operators manually check the data during daily site visits. Operators only had a phone connection to let them know the system was out of spec, kind of like the idiot lights in your car. The new upgraded systems report the actual outputs constantly via the web, so the PUD operators can see how the system is performing on their computers or smart phones at any time, thus avoiding unnecessary trips to the treatment plant and allowing operators to identify and fix issues before they become a problem. The Carson Water System is also conducting a study, fully funded by a Department of Health grant, to investigate the long-term water supply options for the water system. For the Underwood Water System, we are finalizing the design for upgrading the Shepeard tank and pump station. The project, scheduled to start in early summer, will increase capacity and reliability for the Underwood Water System as well as improve the water system’s disinfection facilities and communication capabilities. PUD Commissioners and staff are currently developing a Strategic Plan to establish a coordinated method to allocate resources and guide our activities. A draft of the plan will be available on our website this spring for your review and comment. So, the bottom line is that your PUD is in the process of upgrading much of the aging infrastructure in a planned, methodical manner. It didn’t get old in a short time and the upgrading will take some years to accomplish, but we have a plan in place to accomplish this work. The Skamania PUD has been overestimating the size of our system to Bonneville Power Administration for several years. As a result, we were given a small added discount to what we paid BPA for power. We passed that discount along to you, our customers, in the form of slightly lower electric bills. Now we are being required to fix that mistake. We expect this error to have little or no impact on our ongoing rates to our customers. We work hard here at the utility to keep rates low and provide the best service we can. That includes getting the best possible pricing we can on the goods and services that ultimately go into the bill our customers pay. We want to find every dime of discount we are entitled to, but not a penny that we don’t deserve. Since at least 2008, we provided BPA with data every year that entitled us to a 6% discount on what BPA was charging for electricity. Our data was based on what we thought was the size of our power line distribution network, which sometimes is referred to as our pole miles. However, a mapping project that we completed last year showed that we were a smaller system than previously thought. As a result, we only qualified for a 4.5% discount. That was 1.5% less than we actually received. The cost of the electricity sold to us by BPA amounts to about half of our total costs, so the savings we passed along to our customers was less than 1% of their bills. If your electric bill was $100, it should have been $101. The discount was also a small part of our total BPA bill. We pay BPA nearly $5 million a year for electricity. The extra 1.5% discount we received amounted to about $60,000 a year. In 2014, we started a mapping project that would accurately tell us for the first time how large our network was. Shortly after that project began, the Justice Department notified us by letter that it had opened a formal inquiry to see if we were making false claims to BPA about our system size. We now know that we were. While this is not a criminal matter, doing so, even if it were not intended, violated the law. The Justice Department could have been harder on us, but chose not to be. We accepted their settlement offer. We have to pay back the $362,500 overpayment going back to 2008. We also must pay damages equal to the overpayment, plus some attorneys’ fees. The total comes to about $862,200. We also will pay BPA directly about $180,000 for the last three years that the DOJ chose to exclude from the settlement, freeing us from having to pay damages for those years. While this was a serious matter, it should have little or no effect on the rates we charge our customers or our ongoing operations. We will pay what we owe from contingency funds that will be built back up over time. With our system now fully mapped, we are confident that the data we provide BPA in the future will be correct, so this kind of mistake is not likely to happen again. We will continue to look for each and every dollar of saving we can find, but will hold fast to our values and only take that which we deserve. Underwood substation construction is now complete! The work began in July 2015 and finished in March 2016. 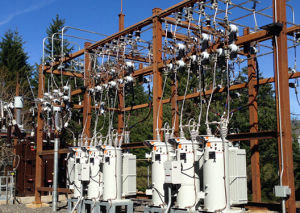 In 2008 the PUD purchased our five substations from the Bonneville Power Administration. At the time of purchase the PUD recognized there were both immediate and long term infrastructure upgrade and replacement needs in all five substations. Within a few years after the purchase, the PUD made some minor upgrades and began planning the first major project to rebuild Underwood substation. The substation is running on a new transformer (the backbone of the substation). The old transformer has been repurposed to be a ready-in-place spare. Voltage regulators were installed to provide consistent service voltage to our customers. Catch basins were built to contain an oil spill in the event of an unexpected leak in one of the oil-filled power transformers. Flexibility was built into the distribution circuits to minimize the need for outages for maintenance or repairs. The completion of this project marks a significant upgrade in quality and reliability of service for the Underwood, Mill A and Willard areas. Remodeling? Building a new home or purchasing a manufactured home? Replacing appliances or lighting? If your answer is yes to any of these questions, are you aware that there are likely energy efficiency rebates available to you through the PUD? The Source: The Bonneville Power Administration (BPA) funds an energy efficiency (EE) program where they establish a bi-annual budget for each of their customers to accomplish approved energy efficiency projects. BPA’s EE program is funded by the rates they collect from their wholesale electric customers. The PUD Board of Commissioners has elected to pass all of the PUD’s EE Incentive budget on to you, our customers. Since the PUD is predominantly a residential service provider, the Board has allocated 85% of the budget for residential EE projects and 15% for commercial and industrial EE projects. The PUD utilizes the expertise of Efficiency Services Group (ESG) to administer the local EE program. What qualifies for EE rebates? How do I take advantage of the program? Before you start your project or make your purchase, it is important to be sure your project qualifies for an EE rebate. For some items, that is a simple as comparing the product specifications to the PUD rebate schedule to verify the minimum EE requirements are met for that product. Following your purchase, complete and submit the appropriate rebate form. Other projects like insulation replacement or upgrade will require a project pre-audit to determine the available rebate. When the work is complete, a post-inspection is done to verify the project scope was accomplished. ESG completes these project audits and inspections at no cost to you. Want more information? You can find more information on the Conservation tab of the PUD website, at https://www.skamaniapud.com/conservation/ . There you will find answers to frequently asked questions (FAQ), the rebate schedule specifying all available rebates, and contact information so you can get your specific questions answered. Please take advantage of the PUD’s Energy Efficiency program. You can reduce the cost of your project, reduce your PUD power bill, and conserve the natural resources used to generate the electricity you use.